This trek is frequently rated in the top 5 best treks in the world and rightly so. Lonely Planet rated it the second best (see full Lonely Planet article here) The classic hike to Machu Picchu following the ancient route used by the Incas, passing through beautiful mountain scenery and lush green rain forest. 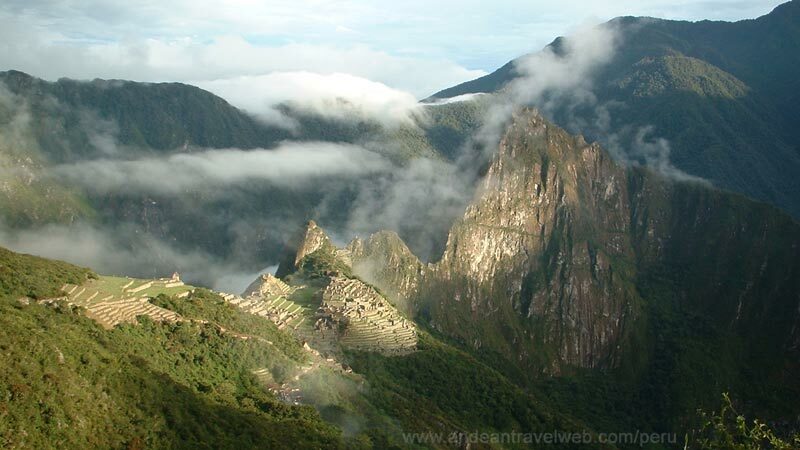 There are plenty of Inca ruins along the way including Runkuracay, Sayacmarca, Phuyupatamarca and Wiñay Wayna. This trail is subject to the Inca Trail regulations and trek permits must be reserved well in advance. The shorter Inca Trail is for those trekkers with limited time on their hands or who just want to take things a little bit easier. This trail starts at km104 and ascends to the ruins of Wiñay Wayna before continuing on to Machu Picchu. Since you don't have much time at Machu Picchu on the first day most people spend the night at the nearby town of Aguas Calientes and return to Machu Picchu again the following day. A beautiful mountainous trek taking you away from the crowds for the first few days and finally joining the classic Inca Trail at Wayllabamba and continuing to Machu Picchu. This trail is subject to the Inca Trail regulations and trek permits must be reserved well in advance. This trek is usually done in 7 days but more experienced trekkers can do it in 6 days. At the moment the alternative treks listed below are NOT subject to the Inca Trail regulations and trek permits are not required. 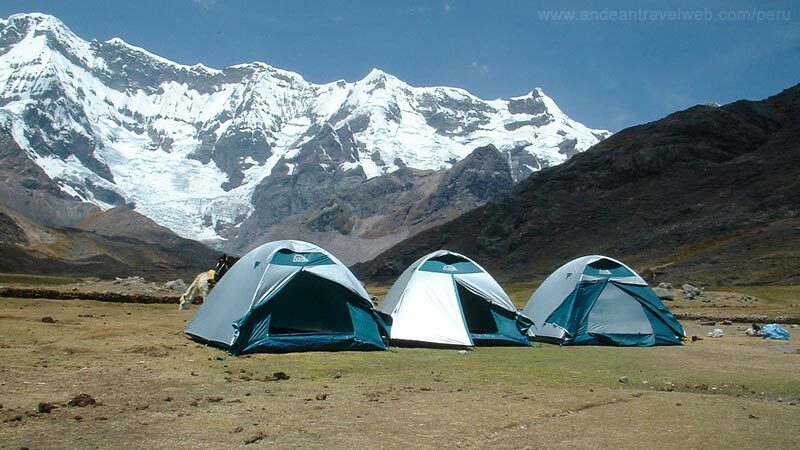 Therefore this trek can easily be arranged just a few days in advance when you arrive in Cusco. However if you have limited time and want to trek with one of the better quality companies we would recommend making a booking several weeks or months in advance. Because these routes are unregulated by the government any company can offer them. There are no controls over group sizes, minimum wages, maximum weight loading for porters or horses, minimum safety equipment or environmental issues such as disposal of rubbish. Therefore there is fierce competition at the bottom end of the market as companies try to offer the lowest prices. Our advice is always to book with a quality tour operator to avoid exploitation of trekking staff and the environment. Although both of the treks listed below usually state that they end at Machu Picchu neither of them enter by way of the Sun Gate. The Lares Treks usually end at Ollantaytambo where you will take the train to Aguas Calientes and then visit Machu Picchu the following day. The Salkantay / Santa Teresa trek ends in the Santa Teresa Valley where you then take a late afternoon train to Aguas Calientes and also visit Machu Picchu the following day. 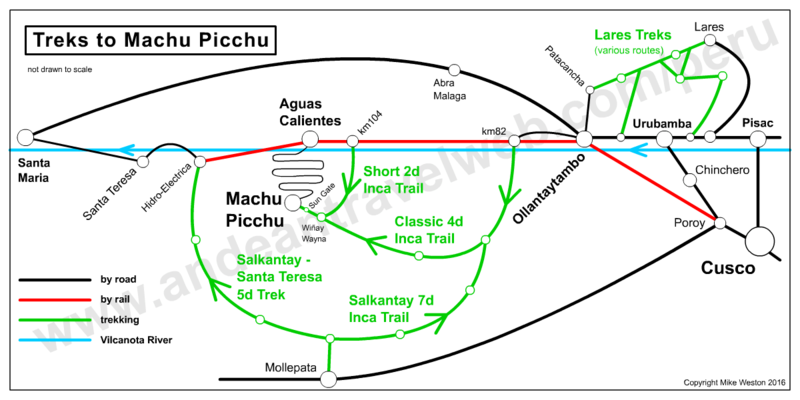 The Lares Valley to Machu Picchu Trek - "The Weaver's Way"
Route: Cusco - Lares Valley - Ollantaytambo . 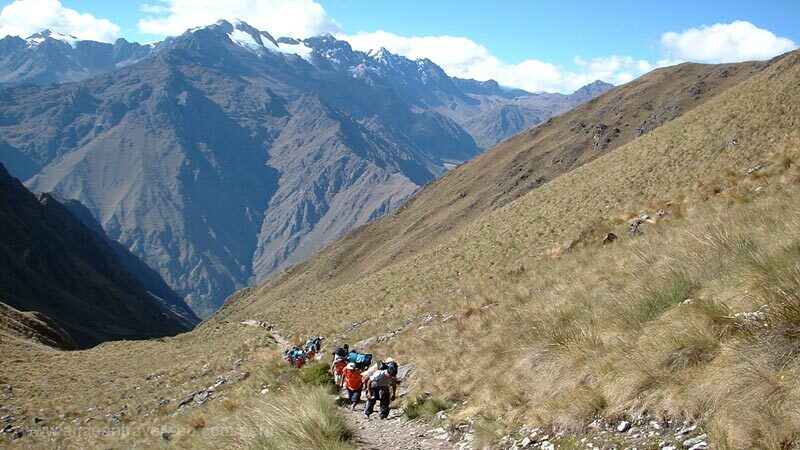 This trek has become a popular alternative to the classic 4 day Inca Trail especially during the high season when spaces on the Inca Trail have become fully booked. The first three days involve a fairly difficult trek to La Playa campsite. The fourth day involves a trek down to the Hydroelectric Plant in the Santa Teresa Valley and then shortly after taking the afternoon train to Aguas Calientes where you spend the night. The final day is spent visiting Machu Picchu and then returning to Cusco in the evening. This trek takes you off to the snowy Vilcanota mountain range and circles the 6384m peak of Ausangate worshipped throughout the Cusco region as one of the most powerful of mountain Apus or spirits. This stunning route often combines trekking and horse riding and takes you through tiny Andean villages and past emerald coloured lakes. A trek for the hardy and well acclimatized. Another of the "lost cities of the Incas". Still rarely visited although with new regulations being applied to cut congestion on the Inca Trail, Choquequirao is destined to replace the traditional hike as the serious trekkers alternative. Follow the route of the retreating Incas in there attempt to flee the Spanish Conquistadors. This steamy trek through the rain forests of the Vilcabamba region is a must for Inca enthusiasts and for those seeking real adventure.